Your child’s first dental visit is an important milestone. The experience they have could influence their feelings about dentists and dental care for the rest of their lives. A positive first visit can be the first step toward a lifetime of good dental habits. That’s why here at Coburg Dental Group, we suggest you plan their first visit soon after they get their first tooth. Even at this early stage, oral health problems can arise. Children can develop problems from thumb-sucking, teething, or nursing bottle decay. 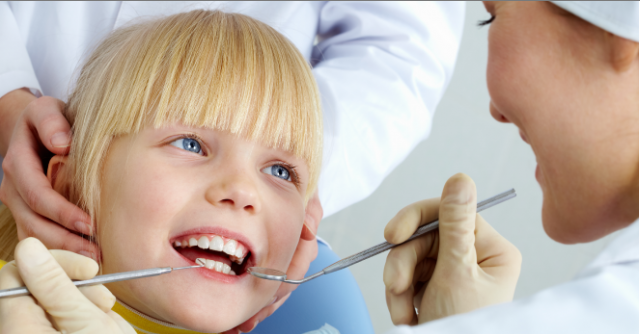 A family dental therapist can assist you with your child’s first visit should there be any anxiety. This will allow both you and your little one to get comfortable with child dental visits. It will help to alleviate any fears you might have about the development of their teeth, and support you to prevent oral health problems right from the start. For young children, predictability means comfort! A good way to familiarise your child with the Coburg Dental Group office is to let them join either you or one of their siblings on a dental visit or two. That way, once it’s their turn to be examined, the procedure will be predictable. The first dental visit should primarily be a fun “getting-to-know-you” session with the dental therapist or dental hygienist. We will take the opportunity to thoroughly examine their mouth, gums and teeth. We may also gently clean your child’s teeth, and, in a child-friendly way, demonstrate the proper way to brush. Don’t wait until your child needs dental care to plan the first dental visit. Remain calm. Even very young children are perceptive, and can pick up and react to any anxiety you might have about the upcoming visit. Arrange for a morning appointment if possible, when most children are more positive and receptive. Words like “drill,” “injection,” and “needle” are potentially very frightening to a child. Refrain from mentioning specific procedures or instruments, as these ideas may confuse or upset your child. Our Oral Health Therapists use child friendly language and concepts that maintain a happy, calm and non-threatening approach to dentistry! If using fluoride tooth paste, ensure that it is a small pea size amount, so there is little chance of your child getting too much fluoride if they swallow it. Encourage your child to spit out the toothpaste at a young age. Children’s toothpaste has less fluoride than adult toothpaste. We recommend children continue on a lower fluoride toothpaste until the age of 6 to 7 – or until their 1st permanent molars erupt. If your child is not spitting the toothpaste, reduce the amount used or alternatively just brush your child’s teeth with a wet toothbrush so as to remove the plaque. Additional fluoride supplements are not recommended for those in fluoridated water areas and already using a fluoride toothpaste. Coburg Dental Group are the proud providers of the very best family dentist services in North Melbourne and beyond. To make an appointment or for any enquiries, Contact us today.